Home / Blog / Have Got or Have Gotten? I’ve always been uncertain about the the participle form of the word get. Is it correct to say I have got or I have gotten? After doing some research, I don’t feel bad about my uncertainty. This is a tricky area with several contributing factors and lots of different opinions. Let’s see if I can shed some light on the issue. One problem is that there are numerous ways to use get — many of them idiomatic. The primary definition is “to obtain or gain possession of,” as in If I clean my room, I get a quarter. It can also mean, however, “to possess,” as in I’ve got a new catapult in the garage. It can mean,”to cause to come or go,” as in I got my brother into the game for free or Get that pelican out of the kitchen. Or it can mean “to have permission,” as in I get to eat ice cream for dinner. Another use is “to cause to be in a certain condition,” as in Try not to get your toga dirty. Get can mean “to arrive,” as in Tell me when we get there. It can mean “to catch,” as in You got me, Copper or “to stump or confuse,” as in The capital of Nebraska? You got me. This song always gets to me. When I get big, I want to be a fireman. I can’t get used to this new fishing pole. You’re going to get it. Okay, so we have all these definitions and uses for the word. That’s no big deal. The question I pose is about the participle form. That’s the form you use with has/have/had in the present and past perfect tenses. Which of the following is correct? A. I have gotten a good education at this school. B. I have got a good education at this school. A. I have gotten a headache. B. I have got a headache. A. We have gotten to leave this party now. B. We have got to leave this party now. One reason for the disagreement on this issue is the difference between American and British English. Americans sometimes use gotten. The British (almost) never do, or at least consider it an archaic form. So, if you live in the U.K., you would answer B to all the examples above. Americans, however, would probably prefer B in the first example. In fact, citizens of the United Kingdom look at us funny when we say things like He has gotten a lot taller since Tuesday. But that’s an acceptable use in the States. In fact, it’s considered more formal here than He has got a lot taller. In other words, non-American speakers of English don’t recognize gotten as the participial form. Got works in all cases, with the exception of archaic expressions like ill-gotten gain. Come see the new TV I’ve gotten. He’s gotten a lot older-looking since last I saw him. They’ve gotten more interested in politics lately. He’s got a lot of money. This does solve the problem, but the use of have got to mean simply have is very common and not in any sense incorrect. Sometimes we use got simply for emphasis. For example, there’s a different urgency communicated when we say, I have to go to the bathroom and when we say, I have got to go to the bathroom. Especially when the speaker stresses the word got. Same goes for You have to be kidding me and You have got to be kidding me. There’s no difference in literal meaning, but there is a notable difference in emphasis. The answer is that you are generally safe to use just got with the helping verbs has, have, or had, especially if you are in the U.K. But there are Americans who much prefer has/have/had gotten in particular situations. My advice is to simply trust your ear. In this case at least, what sounds right usually is. If you’ve got (or gotten) anything out of this post, I’d love to hear about it. Leave any comments below. I become really annoyed when I read a novel filled with get, got and gotten! It is lazy and boring when writers fail to employ a variety of verbs in their texts. Can I be super critical and suggest that Brian is trying to teach young people how to write well, not better. Do you know the difference between persons, people and peoples? I have another question (sorry =/ hehe) . In class my teacher told me that some nouns can be either count or non-count. In the book mention that the words “food” and “fruit”, for example, can be count nouns when they mean categories. Oranges and grapefruits are fruits that contain vitamin C.
I suppose that the first example, fruit is a non-count noun, because they are not categorizing and the second one is a count noun because they are specifying the fruits. Is that correct? And always I have to put fruits instead fruit when I categorizing? Understood =) and I suppose that it is the same with should and might. I found this sentence ..”If she did not bully her classmates, she would have more friends” . Should it be She would has instead she would have?. Thanks for the question, Mary. The sentence is correct as it is. When you use helping verbs like “would” or “could,” you use the base form of the main verb. That’s always “have” in this case. 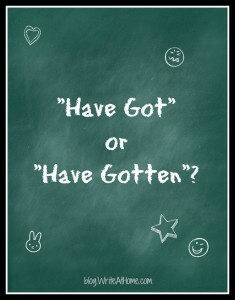 I’ve been doing a lot of searching around on the web for a clear explanation of the difference b/t “Have Got” and “Have Gotten,” and yours was the best! Do you mind if I print this post out and distribute it to my present/future students? I will, of course, give you the credit and attach a link to your blog! I would be honored, Tina. Thank you for asking! First of all thanks for the time and effort in researching and documenting this article. English is my second language since I am from Mexico. I think the explanation is really worth it, I liked it a lot specially when you approached the different idiomatic meanings of the verb “get”. That is certainly very educational if you will. I think the key point is when you differentiate between American and British English. It’s more a matter of the region where it is used. I am surprised “gotten” is an older form of the verb conjugation. I would think it is somehow related to the way verbs are generally conjugated in the German language which is really close to English language, since, as we know, English derived from west Germanic language, in the early medieval times, therefore it is natural both languages still share some similarities. I’m impressed because no one told me before “gotten” is an ancient form. Many thanks for work, it really contributes! I appreciate your taking the time to comment, Mario, and I’m glad you found the article informative. I’m sure you’ve heard this before, but you write exceptionally well considering English is not your first language. Yes, I am about to go to Turin (Italy) to take the IELTS test, so, considering that UK is closer, will try to use more got that gotten, however all the English is known, I learned it in Texas…. I am confused about something pertaining to this post. And here is my question: what is the grammatical form in this example: ‘I have got blue eyes’? HAVE GOT is present simple, present perfect, or totally incorrect to use in formal settings. I’ve come here from Google; I was looking for the name of this gramatical form in: ‘I have got blue eyes’. Is it a present perfect or present simple, and why? Personaly I go for Present Simple because we can drop the ‘got’ without changing the meaning. Besides, this is a description which holds true in the past, present, and future — a fact in other words. Ah, a visitor from the land of Google. Welcome! The present simple would be “I have blue eyes,” or, “I get blue eyes,” though that doesn’t quite mean the same. Make sense? Federer made an outstanding get on Murray’s lob, though he sent the forehand wide. That’s true, Paul. I didn’t think of that usage. Good get. Very informative, and I’ve always been fond of articles/posts/what-have-you about the differences between American and British English since I spent the first ten-ish years of my life in London, and the rest in Texas and Louisiana. One thing I would like to point out though: in the second paragraph of the American English vs. British English section, I think you need to switch the “A” and “B” because right now it says that the English don’t use gotten, but the A answers use gotten…..
On a side note, two interesting things I’ve noticed about UK vs. US English, that may or may not be due to a) shoddy teaching and b) my not being aware of certain rules. First, the use of “vs” and “v” to denote competition or comparison. In England, I never saw “v.” Ever. It took me ages to figure out it was supposed to mean the same things as “vs” over here. I later was informed that there’s actually a set of rules specifying which to use, but I can’t remember what they are, and I remember thinking that it seemed a little odd. So maybe there were rules I wasn’t aware of, or maybe they really don’t use “v” in the UK. Because, at least according to what I was taught, it’s ALWAYS “it’s,” for both the possessive of “it” and the contraction of “it is.” She gave us a bunch of texts–I remember it as photocopied articles, but it may have been photocopies of something she made, or something else entirely–and had us go through and find each instance of “it’s” and determine whether it was the possessive or the contraction. I spend a long time believing that the use of “its” to denote the possessive in the US was a result of Webster’s simplifications when he made his American dictionary. Lately, however, I’ve come to believe my teacher was simply wrong, because I honestly cannot believe that in all of the internet, with all the people yelling about “its” vs. “it’s,” no one has once thought to point out that it’s different in the UK. Oh, and I just remembered one more difference that drives me absolutely NUTS: in the US and the UK, the word “homely” means the exact opposite of the other one’s meaning. In one of them, it means ugly, and in one of them it means pretty, and for the life of me, I can never remember which is which! I’m pretty sure it’s “ugly” in the US and “pretty” in the UK, but I might be wrong. What a lovely long ramble off the topic of your blog, but I’d love to see a professional writing instructor’s take on the UK/US distinctions! And, I figure you’d probably know enough people involved in writing on both sides of the pond to clear up my “it’s” confusion. And, many thanks for a) being so informative and generally wonderful, and b)reading this long, long rambling comment. Sorry it took me a while to reply, Jos. This is homeschool convention season and it’s particularly tough to keep up with the blog. Thanks for the long and thoughtful comment. I love that kind of interaction. Thanks also for pointing out the goof-up with A and B. I had already noticed it and fixed it some days ago, but I appreciate when readers take the time to point out such faux pas. My understanding of the abbreviation of “versus” is that either v. or vs. is acceptable, though v. used primarily in legal contexts. By the way, most style guides recommend spelling the word out other than in informal writing, references to athletic match-ups, or in legal documents. I don’t believe the usage is any different between the U.S. and U.K. Either your teacher was entirely wrong, or you misunderstood her point. The its/it’s distinction is precisely the same on both sides of the Atlantic. Perhaps she was having you identify both correct and incorrect uses of “it’s”? Note that all personal pronouns have possessive forms ending in “s” without an apostrophe: his, hers, yours, ours, theirs. “Its” is no different. Now, the “homely” question is particularly interesting to me. It may become a blog post in the future. The word means “simple, plain, and unadorned” or, more literally, “home-like.” But you are right–in the U.K., it means “plain, but pleasant” while in the U.S., it almost always means unattractive. I’m guessing that originally it was a euphemism, but through overuse, the literal definition eventually changed toward the pejorative. It’s not that I don’t find it intriguing, as a student of languages and anthropology (and art too, but that’s another matter), it’s just that having spent half of my schooling in one country, and half in another, I tend to get in trouble for misuse of words. For example, once in school in America, I said “Damn it!” and got in trouble, because I didn’t know it was a swear word (in England, the use of hell and damn are both perfectly acceptable; this is why the “darn” and “dag-gum-it” sort of euphemisms are never heard coming out of a Brit). And the “homely” one always gets me because my grandparents–who still live in England–buy me books and mail them to me, two, unlike most words that are different between the US and UK they have completely opposite meanings, and three, I can never remember which is which because it took me years of encountering the (admittedly not often used) word to figure out what it was supposed to mean anyway, because as a child I was terrified of the dictionary (a really, really big, thick one fell on my head at school when I was little, several times, and I became convinced all dictionaries were out to get me).